(1999) "No Distance Left to Run"
"Coffee & TV" is a 1999 song by the British rock band Blur. 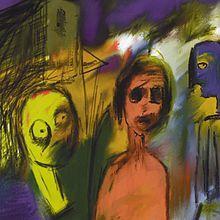 It was written by the band's guitarist, Graham Coxon, who also sang lead vocals, as opposed to frontman Damon Albarn. The song appears on Blur's sixth studio album, 13 and was the second single released from the album. The lyrics describe Coxon's struggle with alcoholism and the song's video, featuring a sentient milk carton searching for Coxon, won several awards. The song's musical style is an anomaly in comparison with the rest of 13, appearing similar to Blur's earlier, Britpop days. Despite featuring heavy guitar distortion and feedback during the instrumental break, major characteristics of 13, the track generally features subdued, calm lyrics and vocals. The edit of the singles cuts off the instrumental part after the fade out and runs about 40 seconds shorter than the album version. This instrumental part is a hidden track, which, though officially untitled, is known as "Coffee & TV Exitlude". Animated milk carton from Coffee & TV video. To promote the single, the band recruited Hammer & Tongs to direct and produce a suitable video. The result featured a sentient milk carton known as "Milky" searching for Coxon, who appeared as a missing person's face on its side. The video won several awards in 1999 and 2000 including Best Video at the NME Awards and the MTV Europe Awards. In 2002, the video was ranked the fourth best video of all time by VH1. In 2005, it was voted the 17th greatest pop video of all time in a poll by Channel 4. In 2006, Stylus Magazine ranked it No. 32 in their list of the Top 100 Music Videos Of All Time. In a similar poll, NME ranked it the 20th greatest music video of all time. In addition the video received heavy rotation on MTV in the US. The model of Milky, as used in the video, was sold at an auction of Blur memorabilia in 1999. The Israeli company Tnuva, which specializes mostly in dairy products, uses a nearly identical character named Tnuvi (Hebrew: תנובי‎) in advertisements for its milk product line. On 12 August 2012, when Blur played at the London 2012 Olympics Closing Concert Celebration at Hyde Park, fans who bought a Blur T-shirt on the day were given a free replica milk carton of Milky. The song plays on TV in season 3 of The Sopranos, in the episode "Pine Barrens". The song reached No. 11 in the UK singles chart on 4 July 1999. Blur manager Chris Morrison believed that it was deprived of a top 10 place after it was confirmed that some sales figures were not recorded. The single edit of the song also appeared on Blur's Best Of compilation, released in 2000, and featured on the Cruel Intentions soundtrack. Piers Martin of the NME selected the track as one of the album's highlights, claiming that it demonstrated that "Graham's a great guitarist and whaddaya know, he's a pretty decent singer". The song was also praised by Straw in Melody Maker. Rolling Stone described the song as a cross between Pavement and Brian Eno circa Taking Tiger Mountain. Coxon's guitar solo on the track has been singled out for critical praise. In a retrospective review, NME declared the guitar solo to be number 38 of the top 50 solos of all time, describing it as "a string of discordant notes, building to a storm of haywire string-bending". The Independent described the solo as "one of Coxon’s finest". All music written and composed by Albarn / Coxon / James / Rowntree. "Coffee & TV" lyrics composed by Coxon. "Tender" lyrics composed by Albarn / Coxon. "Bugman" lyrics composed by Albarn. ^ "Coffee + TV by Blur". ^ Power 2013, p. 301. ^ Power 2013, p. 293. ^ O'Dell, Dennis (2009). "13 - review". BBC Music. Retrieved 26 January 2015. ^ Power 2013, p. 328. ^ "Blur's award hat-trick". BBC News. 1 February 2000. Retrieved 26 January 2015. ^ "Jonze dominates video poll". BBC News. 26 April 2002. Retrieved 26 January 2015. ^ "Programmes - Most Popular - All 4". Channel 4. ^ "Blur auction boosts community coffers". BBC News. Retrieved 26 January 2015. ^ ""The Sopranos" Pine Barrens (TV Episode 2001)" – via www.imdb.com. ^ "Blur boss demands chart re-run". BBC News. 13 July 1999. Retrieved 26 January 2015. ^ Martin, Piers (3 July 1999). "NME Reviews - Blur : Coffee and TV". NME. Retrieved 22 October 2012. ^ Sheffield, Rob (1 April 1999). "Blur 13 Album Review". Rolling Stone. Retrieved 26 January 2015. ^ "50 Greatest Guitar Solos - Coffee and TV". NME. Retrieved 26 January 2015. ^ "Blur at Primavera Sound Festival, Parc del Fòrum, Barcelona". The Independent. 27 May 2013. Retrieved 16 January 2015. ^ "The Irish Charts – Search Results – Coffee & TV". Irish Singles Chart. Retrieved 31 January 2019. ^ "Hit Parade Italia - Indice per Interprete: B". Hit Parade Italia. Retrieved 6 July 2012. ^ "Notowanie nr919" (in Polish). LP3. 10 September 1999. Retrieved 20 March 2019. ^ "Official Scottish Singles Sales Chart Top 100". Official Charts Company. Retrieved 31 January 2019. ^ "Official Singles Chart Top 100". Official Charts Company. Retrieved 31 January 2019. ^ "Lescharts.com – Blur – Coffee & TV" (in French). Les classement single. ^ "British single certifications – Blur – Coffee & TV". British Phonographic Industry. Select singles in the Format field. Select Silver in the Certification field. Type Coffee & TV in the "Search BPI Awards" field and then press Enter. Power, Martin (2013). The Life of Blur. Music Sales Group. ISBN 978-0-857-12862-1. This page was last edited on 20 March 2019, at 16:23 (UTC).